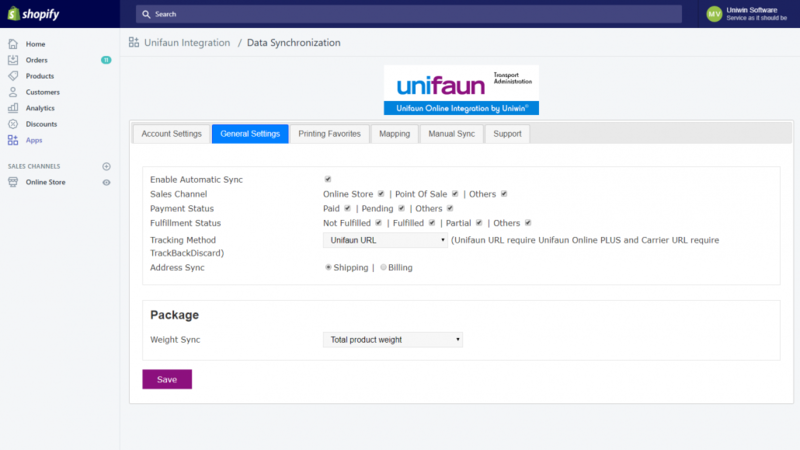 Shopify Unifaun Integration sync shipping details from Shopify store to your Unifaun Online konto. You can let the sync happen automatically and instantly when and order is received in Shopify store, or you can choose to control everything manually. 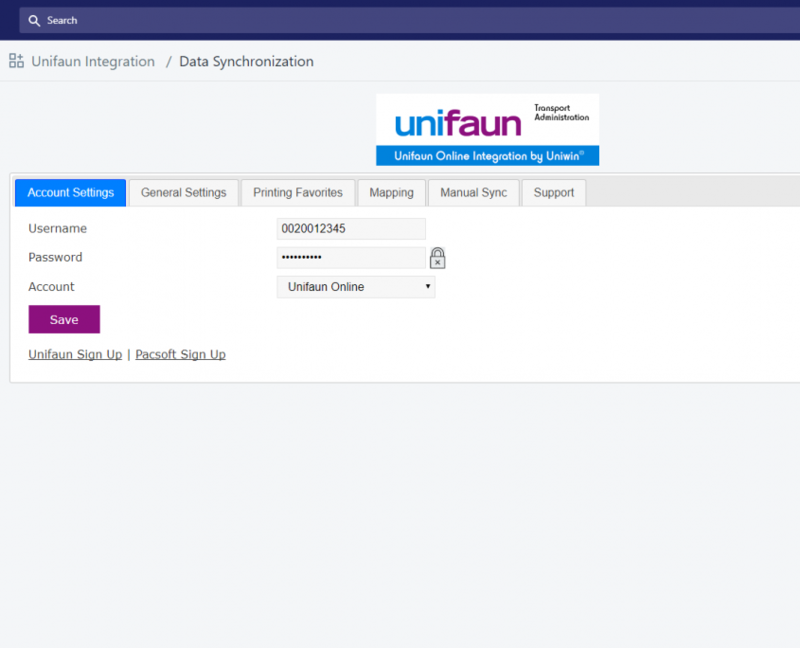 The integration support all major transportation companies and all carrier services that are available in Unifaun Online. Supports multiple delivery agents simultanously, so each shipping option in the store can be mapped to different transport services. Enjoy! When a new order is placed in your Shopify store, Shopify will immidiately notify Uniwin App about this event which in turn will trigger sync of the order details from the store to your Unifaun Online account. If you have automatic sync enabled (default), all this will happen instantly and you will be able to find a shipping label inside you Unifaun Online account few seconds after the order is placed in Shopify. The sync is done with XML posting into your Unifaun Online account. 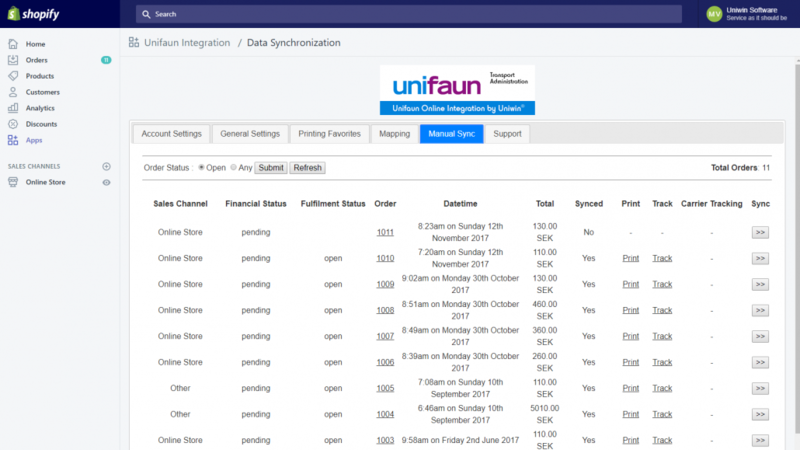 Each Shipping Zone or Shipping Option in your store can be connected to different carrier services or Printing Favorites in Unifaun Online. When you connect a Shipping Option to a carrier service it is called a Simple Mapping. And if you connect a Shipping Option to a Printing Favorite in Unifaun Online the it is an Advanced Mapping, because more advanced features are possible with this option. The Simple Mapping is easy to do. On the drop down menu on the “Mapping” page you simply select your shipping option, and then the carrier name you want to connect it to and click on save button. This will create a shipping label for you when you receive new orders in your store. For Advanced Mapping you need to first understand the Printing Favorite feature in Unifaun Online. Then you can create a valid Printing Favorite and connect it to your Shopify Shipping Option through our Uniwin App. We recommend you to always start using the simple mapping and the change to Advanced Mapping if you need more features. Check our screenshots and videos for better understanding! Compatibility: App is tested on PC with Internet Explorer and Google Chrome. App is NOT tested on MAC / Safari. If you experience any problem with the installation or features, please try with one of the tested browsers. Post sales support is also available through email and Skype. Our free email and skype support will cover all your needs, however if you want any support agreement with us please contact sales@uniwin.se and we will get back quickly. 2. Sign up for Unifaun Online account. if you don’t have one already. Click on the suitable links on the right side for going to the sign up page. 3. 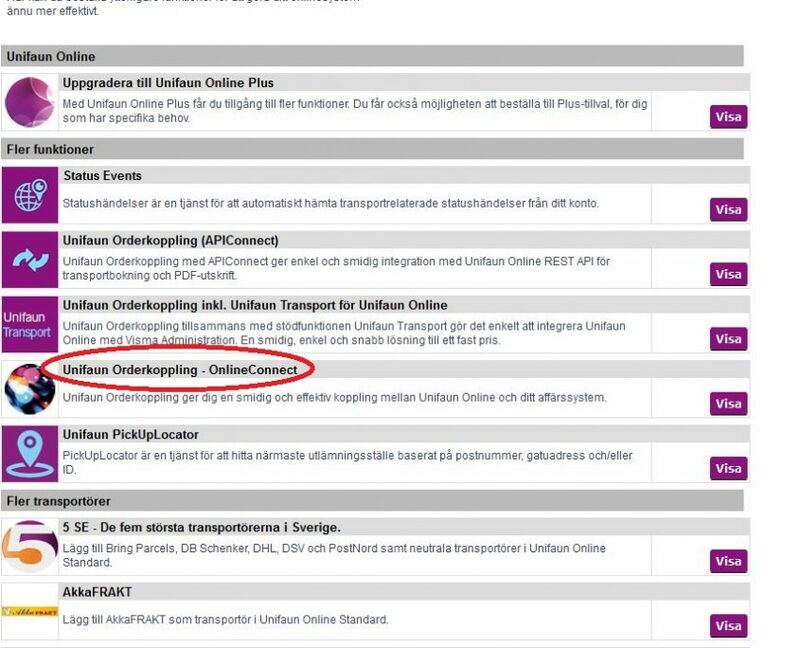 Enable the ERP-Connect (Orderkoppling) on your Unifaun Online account. If you want us to enable it for you, please contact us on support@uniwin.se, startfee is free when Uniwin enables for you. 4. Connect your Shopify shipping option with Unifaun Online Printing Favorite for Print Ready shipping label, or use simple mapping for getting started easier. Check our video guides. 5. Make a test order from Shopify. The shipping label will be created in Unifaun Online immidiately. Good luck! Once an order is placed in Shopify store a shipping label will be created in Unifaun Online immidiately. You can disable the Automatic sync and control this flow manually if you prefer that. Just go to Manual Sync tab and click on sync icon. The app let you do an amazing fast setup for a basic sync, or you can use Printing Favorites feature to setup a more advanced sync that creates a ready to print shipping label. Both setup support all major shipping companies and almost 200 different service types. Each shipping option in Shopify store can be mapped to different carriers and service type independantly. That mean you can setup a shipping zone one carrier and another shipping zone to another carrier. Tracking Link can either be Unifaun Link provided by Unifaun, or it can be Carrier Tracking Link/Tracking Number provided by the carrier. You can select which one to retrieve into the app. Tracking number / link will be available from the Shopify order. 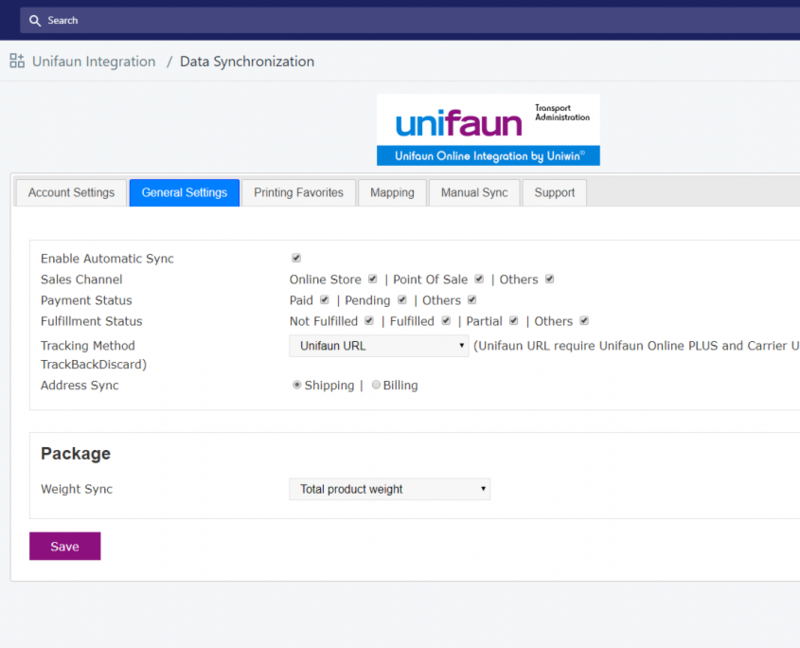 For using Carrier Tracking Number you will need the Unifaun Plus membership with Track&Trace feature, and your free TrackBackDiscard addon must be enabled. You can get a customized version of this Shopify App with special features according to your needs. Cost for customized app starts from 600SEK monthly excluding tax. Additional one time fee will apply for implementing the special features you need. Visit https://apps.shopify.com/unifaun-integration or go to Shopify app store and search on ‘Unifaun’. 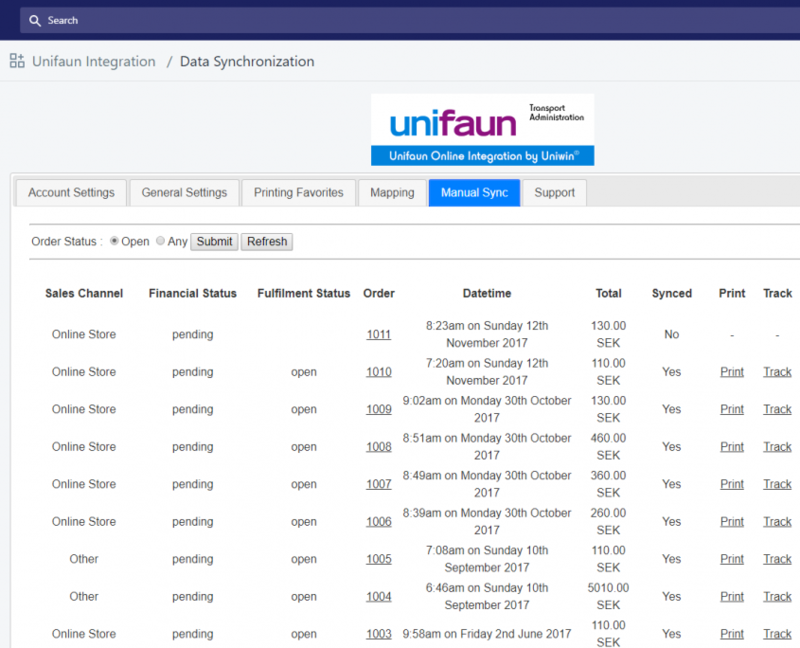 Uniwin’s Shopify-Unifaun Integration will show up, click on “GET” and install the app just as any other Shopify App. By default sync is disabled. Just check on the checkboxes to enable sync, and click the SAVE button. You have to purchase/enable the ERP-Connect addon (orderkoppling) from within your Unifaun Online account, before you can connect the Shopify app to it. 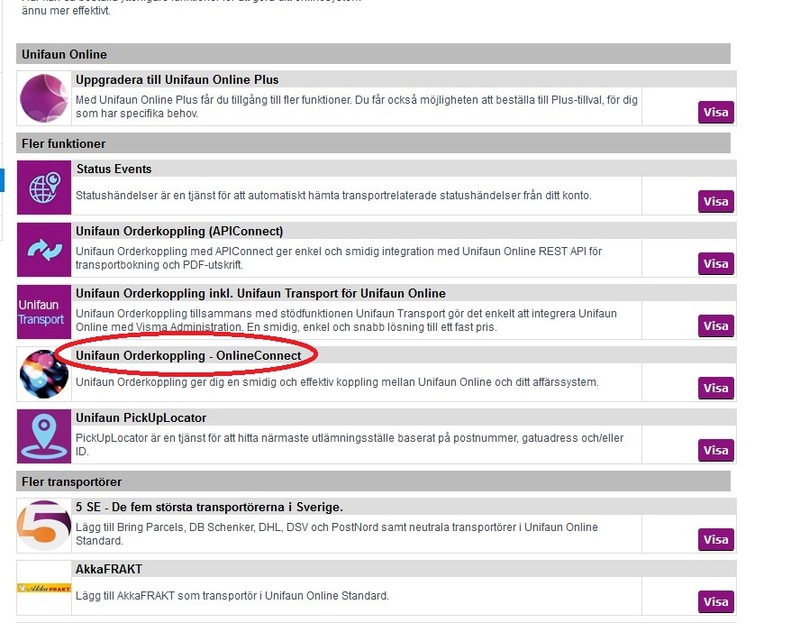 You do it by logging into Unifaun/Packsoft and go to menu WEBSHOP, and there you click on “additional features” (‘Lägg till mer i systemet’), and choose the ERP-Connect addon with XML posting. Be aware of the additional costs for this addon. You can contact Uniwin Support if you want us to enable it for you. Step 1: Select “Standard Shipping” in Shipping Options. Step 3: Select “DHL Express 12:00 Domestic” in Service Type. Step 5: (optional) If if want to add any additional attributes to shipping label, click on the EDIT button for this mapping. If you leave all attributes empty, then your shipping label needs to be finalized before it can be printed; until then the shipping label will have status “Invalid” in your Unifaun interface. A valid “Mapping” must be created before you can use the Manual Sync option. 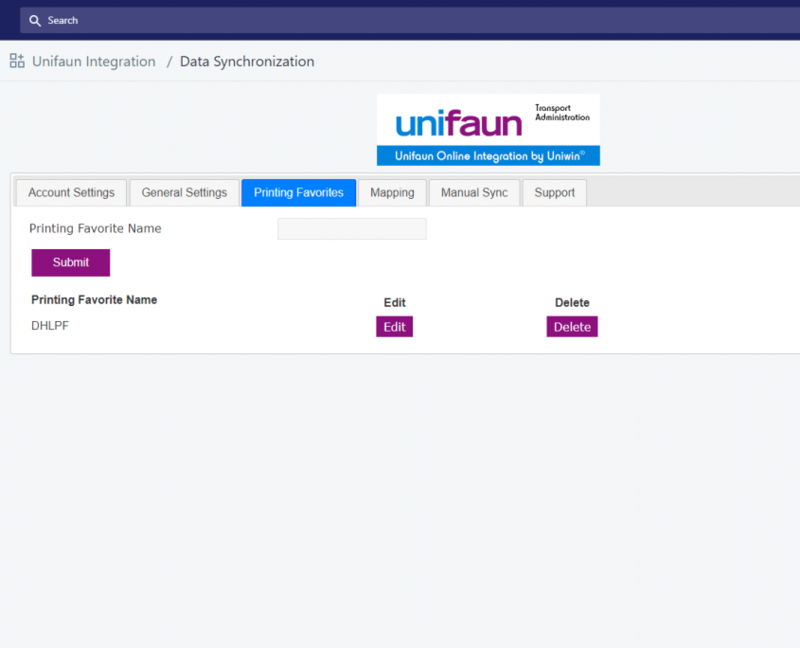 Step 2: Find the ORDER that you want to create shipping label for, and click on the sync button “>>” for creating the label in Unifaun. Note: If a valid mapping does not exist for the selected order, it will show an error. Step 3: When mapping a shipping, now please select Printing Favorite on “Shipping Company” and select your created Favorite afterwards. What is the right product to purchase for using the XML posting? No, your only cost is 20$ monthly for up to 1000 orders per month. If you need any technical help with your webshop, that is not related to this app, then it will be billed our ordinary hourly rates. Of course. You pay for each starting month. Do you have any technical documentation? Please contact us with information about what kind of technical information you need, we will provide! How do I print the labels from the Shopify order view? In orders preview page, there is an option for Print label(See Screenshot). How to print a INVALID status label? Advanced Mapping is when you associate a Shopify Shipping Option with a Printing Favorite in Pacsoft Online. Simple Mapping is when associate a Shopify Shipping Option with a carriers service using the drop down selection menu. A valid shipping label that is ready to print contains all necessary variables. When you use the Simple Mapping some of those necessary variables are not filled in, so the label will have status INVALID. You have to then open the shipping label by clicking the small arrow sign near the label and fill in the missing values for finalizing the shipping label. Then you can print it. Unifaun application automatically sets every order to status "Open", How can I stop? When tracking is enabled, our app sets the status to open. The usage of tracking in our app is causing this. If the tracking method is set to None, our app will not change the status. If you get this error, you might not have enable your ERP Connect (Orderkoppling) or the credentials are wrong. – Please check your credentials. – Please follow our provided instruction to enable XML posting. If you need any help, please contact our support. When you are mapping a Shopify shipping option (for instance Standard Shipping) to a carrier service (for instance DHL Express) then there are several values necessary to make the label VALID, and those values are obviously not set. So map your Shopify shipping option to a Unifaun Printing Favorite to get a VALID label. You find video guide and written PDF instruction on our website. Sorry you do not have active status for subscription. please click on continue to get approve. Please contact support@uniwin.se, We will help you.